Just recently, Fujifilm announced that they will no longer develop firmware for the X-100S. This just may be a prelude to their paid program that they hinted at a few months ago. In other words, they may develop a new firmware for the X-100S, but you will have to pay for it in order to have it. I suppose time will tell what will happen next. Despite brushing the X-100S aside in regards to firmware updates, they have just released a new firmware upgrade for the X-100T. Version 1.10 is the first firmware update for this camera. As always, proceed with caution when downloading and installing the firmware update. Follow the instructions step-by-step, i don’t want you to brick your camera. An external flash will fire when the “MECHANICAL+ELECTRONIC” is selected in the “SHUTTER TYPE” option of the shooting menu. When the dual optical viewfinder/electronic range finder (ERF) display is used with the Digital Split Image, the white Focus frame appears in the center of the viewfinder. 4.Improvement of Focus Peaking display in the electronic viewfinder under a dark environment for easy focus setting. Once again, Fujifilm is keeping it’s customers happy by listening to them. Install cautiously and enjoy the new enhancements. I don’t have a very big camera bag. I got mine as a gift from my wife when i had my D3000 and two lenses. At this point in time, i have pretty much out grown it. But, it is a great camera bag and compact to walk around with. I can fit both my Fuji X cameras in my bag very nicely. If I get creative, I could probably fit two other lenses in the bag. -I carry both battery charges with me, but i don’t usually carry both cameras with me. I think it’s safe to say that i can take one battery charger out. -Some lens clothes, which are inside the screen protector package. 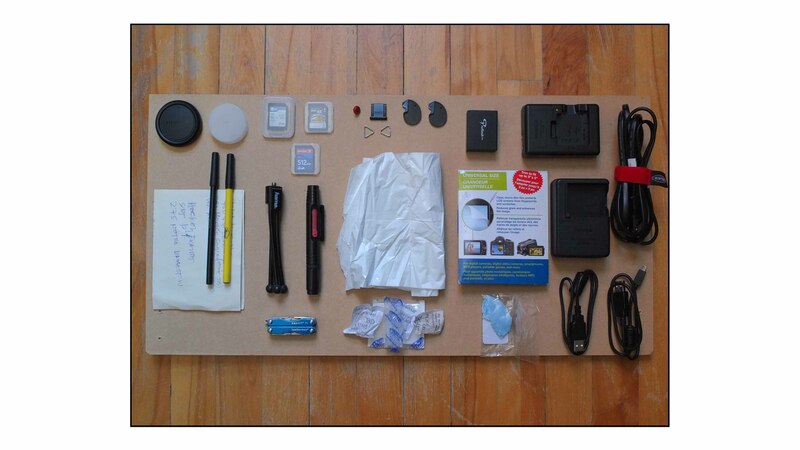 -Body cap and extra lens cap. -Some silica packs to keep things dry. -Hot shoe cover (don’t use it). -A mini tripod, which would only be able to hold my X10. An explanation on a few of the items. Pen & Paper: Good to have in order to write down specific settings. Plastic garbage bag: If it starts to rain real hard, i can put my camera bag inside the garbage bag and keep everything dry. Multi-tool: You never know when you may need a screwdriver, knife, pliers, etc. That is all I have in my bag at the moment. It is actually quite light compared to having a DSLR and a few lenses in it. I rarely carry both cameras with me, even though i am an advocate of owning two cameras, one as a back-up. Weird, i know. I have been using Nikon NX2 ever since i purchased my first DSLR back in 2011. For me, it was an easy program to use and after years of using it, i was able to navigate the interface with ease. Sadly, i have had to get rid of it. A few weeks back, i was doing some work in NX2 and it just stopped working. Therefore, i closed it down and restarted it. Even though i performed this operation multiple times, NX2 would simply keep crashing. The weird thing was, every time i restarted it by double clicking on a photo, the photo would come up in NX2 at 100% zoom. Yeah, weird. In order to try and solve the problem, i uninstalled the program, restarted my laptop, cleaned up the registry and re-installed NX2. To my dismay, this did not help either. At this point, i said to heck with it and just took it off of my laptop. There was no way that i was going to bang my head against the wall, trying to figure out why NX2 was conflicting with Windows or another program. However, i am going to assume that the last batch of windows updates had something to do with wreaking havoc on NX2. Speaking of those windows updates, i actually had to roll my computer back to the day before i installed those updates. Not only did they mess up NX2, but they also made the mouse on my computer go a little wonky. I have re-installed the updates, but not the massive one (i don’t remember the K#). That huge update was apparently giving many other users of Windows 8.1 headaches. Now i am forced to learn Photoshop even better, which is a good thing. I also have access to PhotoDirector, which came on my laptop. It’s a nice program; but yet again, i have to learn a new software. Wish me luck. Star Alliance is the biggest airline alliance worldwide. 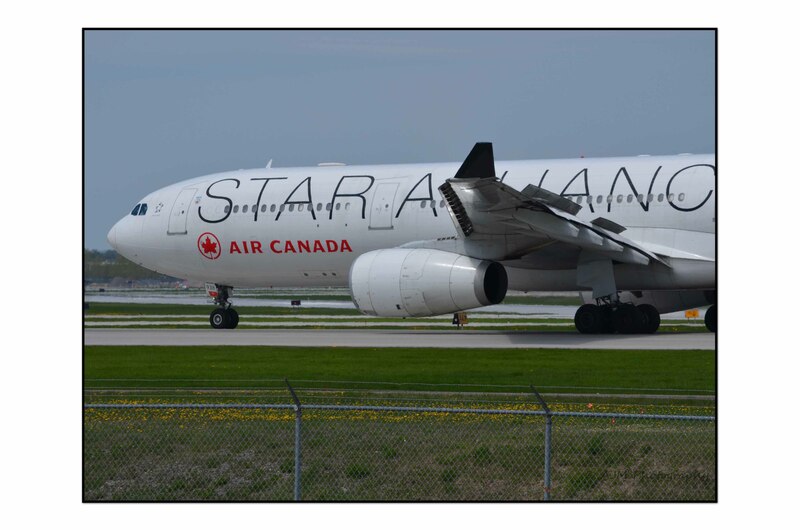 Air Canada was one of five founding airlines that began the alliance back in 1997, along with: Lufthansa, Thai Airways, Scandinavian Airlines and United Airlines. 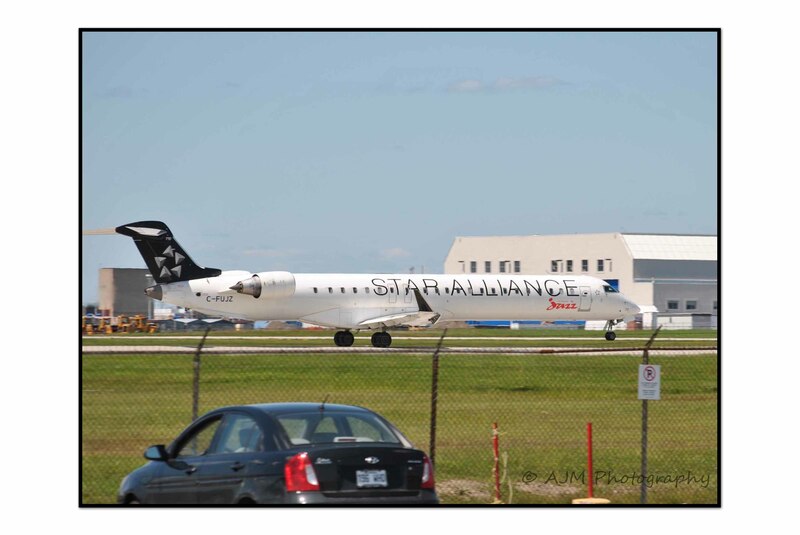 Star Alliance is headquartered in in Germany and it’s current CEO is Mark Schwab. Look closely at the Star Alliance logo and you will see that it is composed of five triangles, with each triangle representing one of the founding airlines. Since it’s founding year of 1997, Star Alliance has grown from 5 members, to 27. This alliance of 27 member airlines combined, is responsible for over 18,500 flights per day, around the globe. The more then 18,500 flights reach 193 countries and serve 1,321 airports in all. With that many flights per day, many people are moved around the world per year, 637.6 million to be exact. 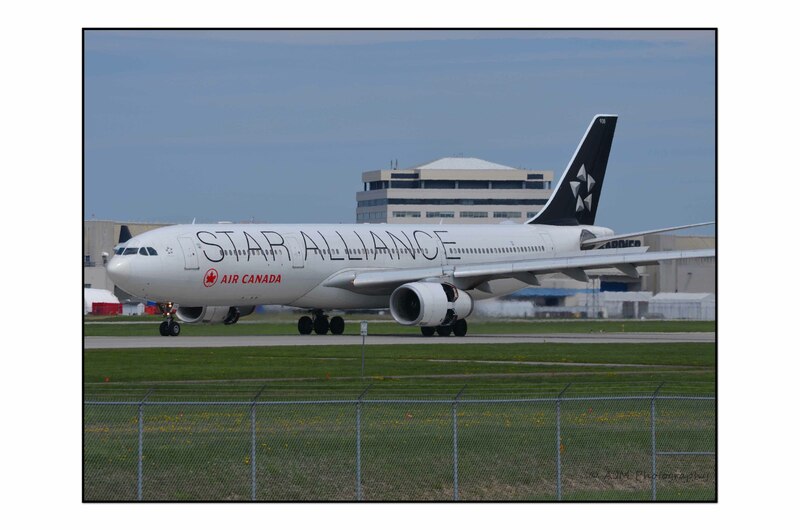 Unfortunately, i have not been able to catch any other Star Alliance aircraft aside from that of Air Canada. 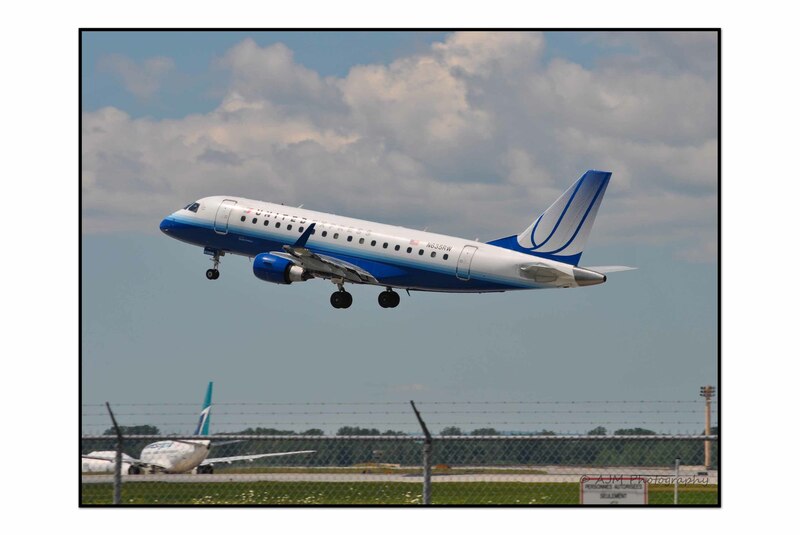 In October 2010, United Airlines and Continental Airlines merged to form one airline. 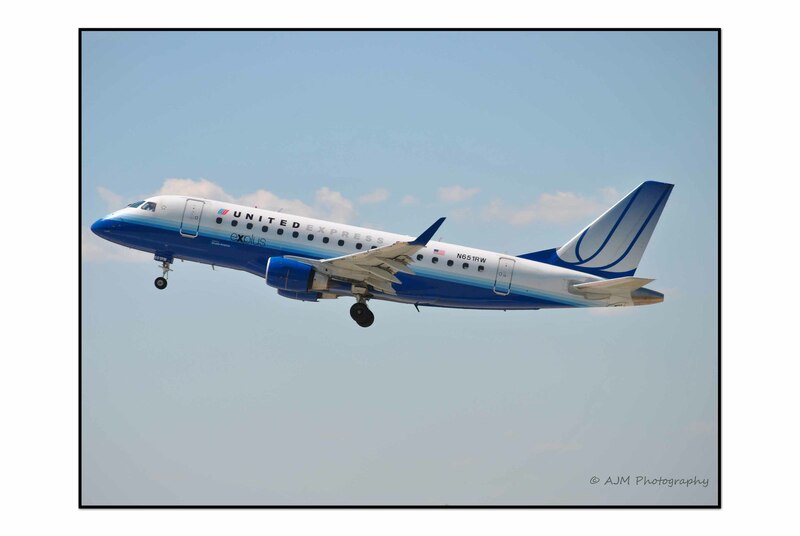 From 2004 up until the merger, United aircraft had a white and blue livery, called the Rising Blue livery. 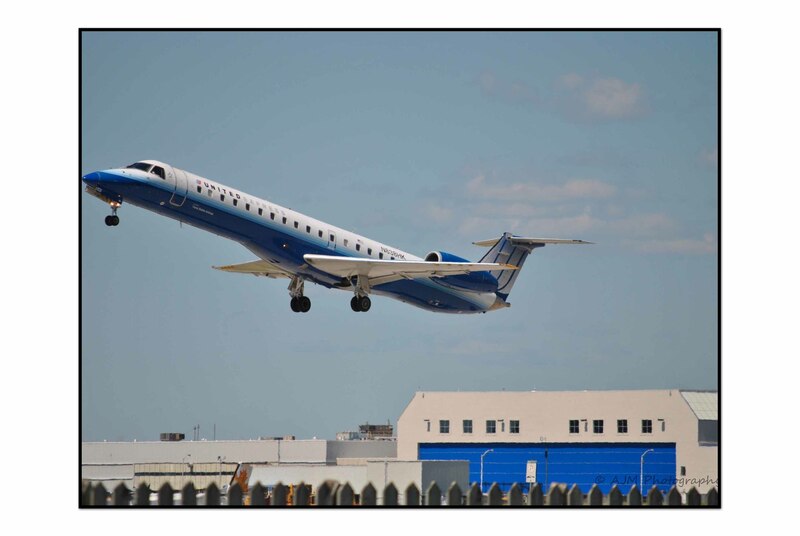 Below are some examples of United Express aircraft in the Rising Blue livery. Every once in a while, i will catch an aircraft that is somewhat unique. A couple of years ago, i caught a Bombardier Challenger 605 being delivered to Qatar Executive. Qatar Executive is essentially a jet aircraft charter service. Aside from the charter service aspect of the company, Qatar Executive also has several other divisions within it’s company, such as: aircraft management, aircraft maintenance, private jet holidays and VIP service at Doha. 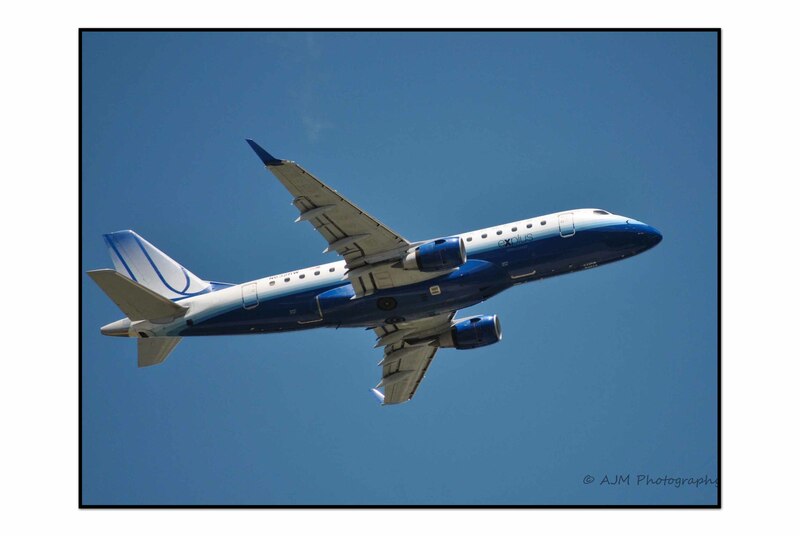 Here is the Challenger 605 that i caught. This particular aircraft was built in 2010 and was delivered to Qatar Executive on July 17, 2011. 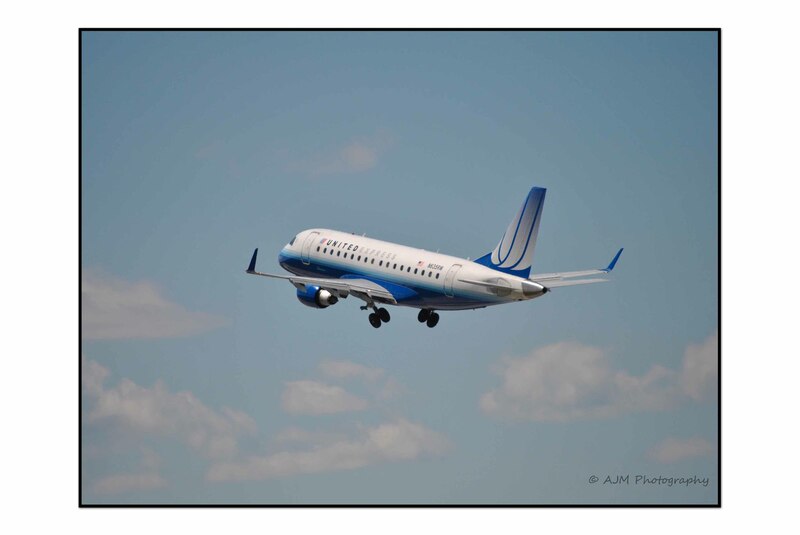 I photographed the aircraft on July 9, 2011. In the photograph, you will notice that the pilots have the RAT deployed, most likely to test it out before making the long distance trip across the Atlantic. 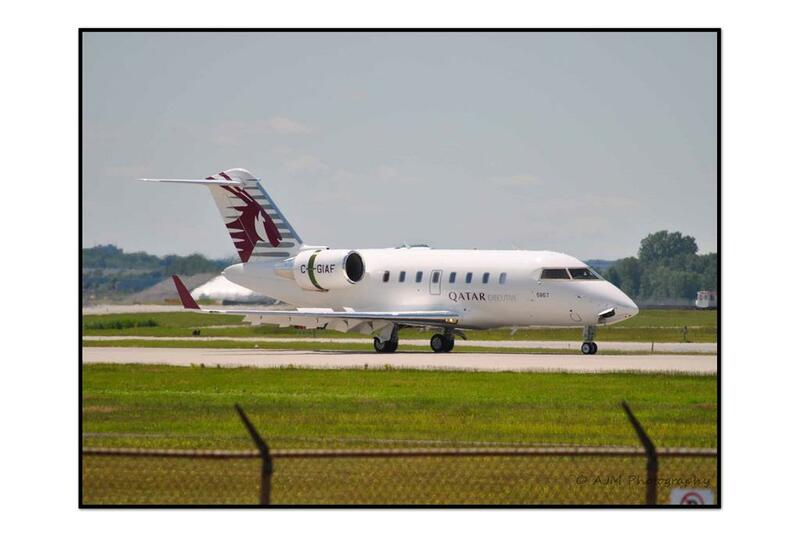 This particular aircraft’s registration is now A7-CEG and still flies in the Qatar Executive fleet. I have gone on and off watermarking my photos within a years time and now i am back doing it. Essentially, i stopped doing it because Photoshop was chewing up my JPEGs. Though, i figured out why Photoshop was making a mess of my JPEGs and i started to watermark once again. Furthermore, i was silly enough to heed the advice of pf certain “photographers” online. It seems a little bipolar going back and forth like that, but that is what happens in photography at times. You tend to inject a routine into your workflow, but stop doing it because you listen to some prat on YouTube. A bit of advice: don’t always listen to what you hear or pay attention to what you read on the internet. Don’t get me wrong, there is some good information on the interweb, but you really have to sift through the chaff to get to the wheat. As anyone else who runs a photographic blog/website on the internet, i am concerned about my photos being used without my permission. As you may know from reading my post about that subject (https://d7100shooter.wordpress.com/2015/01/20/my-photos-being-used-without-permission/), there have been quite a few of my photos that have been “borrowed” without my permission. Because of this, i have constantly been on the lookout for ways to protect my photos. One of those ways that i have been using for a while now, is watermarking. I started to watermark my photos about a year ago, thinking it would just look cool with my “signature” on my photographs. I really gave no thought about how watermarking would be a deterrent to someone wanting to steal my photos. In all honesty, i never thought anyone would be interested to steal my photos. I was wrong of course. When i started to watermark my photos, i was putting the watermark in the lower right hand corner of my photos. However, when i inspected my photos more closely, i noticed that there were some weird “artifacting” going on. At first, i did not think much of it. But, as time went on, it started to get to me, so i stopped running my photos through Photoshop to watermark them. After some time of not watermarking my photos, i investigated how i was watermarking my photos in Photoshop and i noticed that i had set up Photoshop to convert my JPEGs to “high quality JPEGs”. Now, obviously that did not make sense, since the JPEGs i was producing were already of high quality. So, i unchecked that little box. After that, i did not see anymore issues with my my JPEGs and i am now back to watermarking my photos. Is watermarking your photos going to stop people from stealing them? The short answer to that, is no. Like any other “security” feature, it is but a deterrent for those that are just not determined enough. If someone is skilled enough, they will steal your photo and get rid of that watermark with a clone tool or just crop it out. Where should you put your watermark? This is entirely up to you. 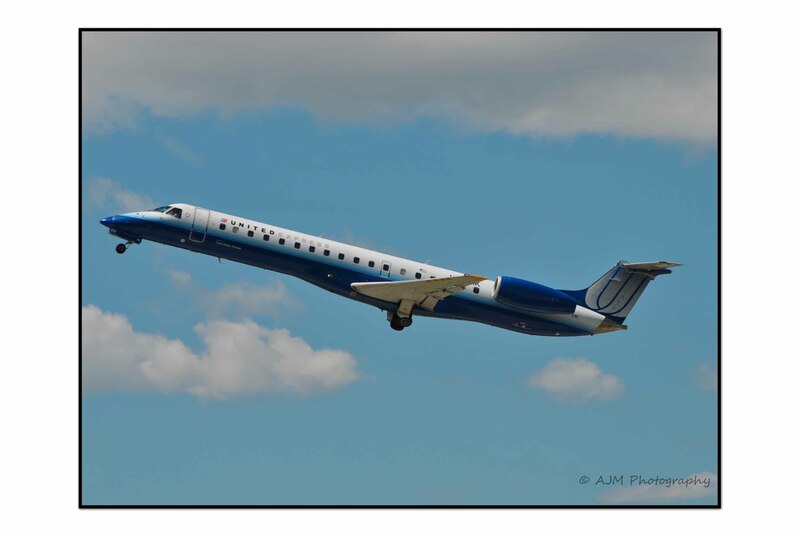 I am no expert on watermarking, but i would try my best to put your watermark on a complex or busy part of your photo. I say this, because if your watermark is overlaid on top of a solid color in your photo, it is quite easy to clone out the watermark. On the other hand, if you can manage to put your watermark over a busy area of your photo (an area where there is lot’s of detail, color, etc. ), the harder it will be to clone out the watermark. In regards to exactly where to put your watermark, you can put it in either lower corner or in the center of the photo (you can also put it pretty much anywhere in your photo, but the three areas i mentioned, seem to be most common). Putting your watermark in the lower corners does make it easier for thieves to crop out the watermark, depending on how big your watermark is. Putting it dead-center in the photo, may also cause some problems, mostly with your viewers though. Not everyone likes to look at a photo with a watermark running through the center of it. How noticeable should my watermark be? Again, this is entirely up to you. Not being an expert, i would say that you don’t want your watermark to dominate your photo. Rather, you want the content of your photo to be what the viewer is noticing the most. Therefore, i would say keep the font small and make it translucent. Personally, i would stay away from injecting any symbol or logo into your watermark. This will only make it that more noticeable and distracting to the viewer. Keep it simple. Do i really need to watermark my photos? No, you don’t have to and i am not twisting your arm to do so. It is just a bit of added insurance and peace of mind to you, the photographer. It is only a deterrent (like a car alarm, house alarm) and not a guarantee that your photos will not get stolen. If someone really wants them, they will take them. For the casual person who just wants a photo of subject x for their blog, they will most likely move on to another photo once they see your watermark though. This has to be one of the most stupid statements i have ever heard. It’s kind of like saying, “If you don’t want your car stolen, don’t park it out on the street.” Wow, do we really need to be blaming the victim here? Aside from the victim blaming, the people who use this statement need to wake-up and realize that we are in the 21st century. Could someone please tell me how else we are supposed to deploy our photos in a digital age? Sure, we could print them all out and rent gallery space in the artsy part of town, but we don’t all have bottomless pockets. The gallery of the 21st century is the internet, it is WordPress, it is SmugMug. I would love to see these people try and get noticed to any degree if they had no online presence along with their photos. Lesson: don’t listen to people who are mentally stuck in the 20th century. Watermarking your photos is not the silver bullet to solving online photo theft. Although, as i pointed out before, it is a deterrent and better then not having anything at all. Be discreet with your watermark and do not take the attention away from content of your photo. Your watermark should be like the Secret Service guy off in the wings. Yeah, you know he is there, but your main point of focus is the President. If you have not tried watermarking yet, give it a go and see how you like it. Just keep in mind some of the things i have said in this post.